Hoping to leverage off your experience on your power cord and related accessory inventory. I'm picking up a 27FB International Signature from the dealer this coming weekend and haven't yet purchased any power cords. Can you recommend a good combination of cords, adaptors, dog bones etc to have on hand…including make/vendors and what I should expect to spend. Also interested in what I need to run some awning lights…just an ordinary extension cord? All opinions and expertise much appreciated! "dog bone" adapters for the 30a - 20a. That will allow you to plug into a normal household plug for 15a or 20a service. Will power the converter but may not be sufficient for AC or microwave. But when you're parked it will charge your batteries so you can run most everything else. ALSO useful but somewhat less essential is the dog bone for 30a - 50a. You may encounter some more recently upgraded campground services that have only a 50a plug available at the post. This has only happened one time to us. ALSO on the less essential side would be an extension to the 30a power cord. Again only one time did we need one. Could have moved the trailer closer but since I had one life was a little easier. These should all be available through Camping World so easy to check their website for pricing. The adaptors are pretty cheap but the cable could be pricey.
" Democracy is the worst form of government. Except for all the rest"
Congrat on your new AS. When we purchased our AS it came with a power cord for the electrical boxes at the camp site. We did have to buy an adapter that we could use on a regular outlet and on our generators. Don't remember the cost of the adaptors but you should be able to find them at Lowes or Home Depot. Although I do not use awning lights I have used a regular extension cord, designed for out door use, for other electrical devices. If you are going to use the extension cord when it is below 40 degrees, I would recommend you buy a blue jacketed one, They do not get stiff like the orange ones do when it is cold. You should buy one with 12 gauge wire not the cheap 14 gauge ones, unless you are just going to use it for Christmas lights. Even with 30 amp service, which is everywhere, the 50 to 30 amp dogbone has been useful to me more than once. In both cases the 30 amp outlet on the post was old and worn. Once the power cord literally fell out of the outlet if the post cover wasn't closed tightly, in the other I just found that the outlet face had heavy damage to the plastic, and I didn't want to have a shocking connection. 50 amp outlets have less wear and tear most places. Carry at least 1 LONG heavy outdoor rated extension cord. A couple of 10 to 20 footers are useful too. I had a 30 amp cord stolen (I left it unattended while I went to dump my tanks. Lesson learned.) and we kept the trailer warm by popping the screen out of the Fantastic fan, threading a cord out to the post, and plugging it in to my Dyson Hot/Cold. New 30 amp cords aren't cheap, so in a strange campground you might want to run it through the spokes of your wheel, then padlock the loop shut. Unless you have a neighbor you know and trust, keep temptation out of the way of strangers by locking down everything or leaving someone to watch all of your possessions. A rottweiler with and attitude will do nicely. Today is a gift, that's why they call it the present. I have ordered all the 50amp power cords and adapters for our new Classic directly from Furrion. They are a top line quality manufacturer for both marine and RV power cords. They are not cheap knockoffs like in some camping stores. I also had their products for the 25FB International Serenity. First, every camper I've ever seen comes with a power cord. Check that before you spend money on something you don't need. Third, I'd like to get a 50 amp dogbone adapter, but just haven't gotten around to it. It's a good idea to have one. Fourth, a 30 amp to 15 amp adapter is a must-have; up until very recently we used ours at home all the time (we now have a 30 amp outlet at home). Don't pay more than $5 or $10 for one. Lowes, Home Depot, Wal-Mart, etc. all carry them (here's one on Amazon. I also have a 30 amp to 20 amp adapter, but I've never used it, so I wouldn't bother with it (I got it for a rally at a VFW where we had 20 amp power available, but the outlet was too far from the camper to use anything but a long 15 amp extension cord). Fifth, if you do have to buy a cord for the camper, I recommend that you find one of the ones that stays flexible in cold weather. The standard ones that usually come with the camper do not, and it's annoying. Even above freezing, when it's cold, they get stiffer and hard to manage. I don't have any recommendations on brands - we still have the annoying cord. The Furrion cords probably remain flexible in cold weather, but make sure you get one with the correct RV male end. Shouldn't that be a 15-to-30 adaptor instead? and haven't had any trouble since. It doesn't try to unplug itself under the influence of gravity. If you are planning on using awning lights you might want to consider a wireless on/off switch. They are usually offered this year as an item to use on a Xmas tree. I have one and like the ability to turn the awning lights on/off from inside the trailer. They are 120v and plug into an extension cord. I bought one intended for use with a shop-vac; the remote is attached to a Velcro band, which made it easy to stick up where I won't lose it. But I made one miscalculation. It's not intended for outdoor use, so if rain starts up I have go go out and unplug it, even if there's not enough wind to require retracting the awning. So I just bought another one, specifically intended for outdoor use. The remote has a keychain ring, that I can attach to a belt loop on my pants if I'm not schlepping my keys with me. Furrion has a short gray pigtail that will fasten into the 30 amp power twistlock socket on the Airstream and the other end is a 15 amp plug. 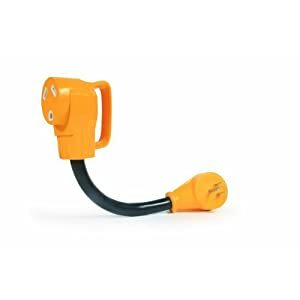 It also has a bright power LED that is easy to see in the dark to verify that power is coming to the trailer power input. Their website price includes shipping and no sales tax. This pigtail could also be connected to their 30 amp 25' extension cord. And this is a short yellow 50 amp to 15 amp pigtail. I used this 30 amp pigtail plus a 25' 15 amp extension cord made with #12 wire at the storage unit rather than having the more expensive 30 amp cord connected with a 15 amp adapter. We are supposed to use less than six amps to just keep the batteries charged. I will use the 50 amp pigtail on the new trailer. I'm certain you know the correct specification. But I see a 30 amp plug that I need to put into a 15 amp socket. I just look at the item or the pictures to ensure I have the right thing. I'm like you… I look to see if what I'm buying plugs in the way it's supposed to. But as an engineer by profession, I'm also pedantic by nature. I meant no criticism. Adapters are usually listed as from-to, so from 15-amp supply to 30-amp RV. The biggest adjustment to retirement— coming up in about a year— won't be the much better working hours, or the much reduced paycheck. It will be learning how to quit using engineering jargon! No more need to call a spade a spade if calling it a shovel is good enough. Shall we start a betting pool on whether or not you'll be able to mend your ways? I'm a computer programmer and an obsessive stickler for using the technically-correct word or phrase, even when it's not related to computers. I'm not sure there's any hope for us, even in retirement.